Plot: Product Description: Director Richard Loncraine (The Missionary) gives us a cinematic version of Ian McKellen’s heralded 1990 National Theatre stage performance as the vile but fascinating Richard III (1995). Updating Shakespeare’s most entertaining history play to the 1930s, the filmmakers offer a slick-haired fascist Richard, disturbingly recognizable as one of our ambitious own, coldly, pleasurably eliminating his enemies. This is one of those films I often return to over and over to experience wonderful acting and direction. I think this is one of the greatest retelling of this classic Shakespearean story. Directed by Richard Loncraine. Loncraine has not done a lot of cinema. But the cinema that he has done, tends to stick out, both great and small. He captures both TV and feature film. Besides directing Richard the 3rd he has captured an odd array of drama, comedy and unique pieces of cinema, some forgettable and some that I feel should be seen. Those to look at, 1980’s Blade on the Feather, 1982’s Brimstone and Treacle and 2002’s TV movie The Gathering Storm. His defining achievement is Richard the 3rd. I am excited that Richard III has been given an outlet by Twilight Time. This is a lovely transfer, vibrant and brilliant in video and audio. Like many of the Twilight Time releases, this is a Blu-ray that should be experienced. 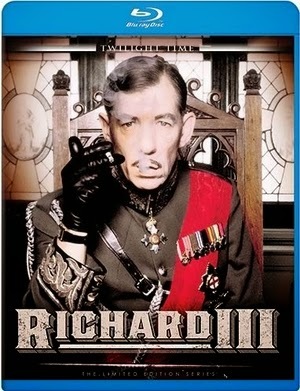 Richard III has never looked any better than this blu-ray presentation. I feel Twilight Time has honored this great film. This film has acting by one of my favorite performers, Ian McKellen. A true perfection in the art-form of acting. McKellen has always thoroughly entertained me, in anything he has ever done. He has graced cinema both small and large, starting in the 60’ and still going strong. Some of the greatest films he has performed in, 1993’s And the Band Played On, 1997’s Bent, 1998’s Gods and Monsters, to one of my favorite performances of all time, as the character of Kurt Dussander in 1998’s, disturbing and brilliant Apt. Pupil. McKellen is able to transcend the idea of performance and bring that performance to life as a living, breathing experience, simply put, he becomes the parts he plays and gives us, his all. The part of Richard the 3rd is no different. This is one of his defining roles that leaves the viewer in total amazement in how far a performance can go, as a living art-form. I think what is so different and unique about this film, is the ultimate setting. They have taken the plot of Shakespeare’s story and placed it in the 1930’s, inside a fascist state of Great Britain, giving it a unique and twist, to the already brilliant play. Also Loncraine and star McKellen, helped write and adapt this new vision into a script form and ultimate creation of film. Another thing that truly stands out is the acting performances by all. There is such a wonderful cast of actors and actresses. It’s almost like experiencing an ensemble class of mastery, on just who to use in a film, if you want some perfection. Not only McKellen, but the beautiful and stunning Annette Bening, the amazing Robert Downey Jr, the extraordinary Nigel Hawthorne, the magical and beautiful Kristin Scott Thomas. Also the one and only Maggie Smith. Smith is someone that I have been in total love with my whole life. That is something that makes Richard III stand out. All the performances are flawless. Something else that stands out about this film is the costumes and set pieces. The art direction and costumes are just breathtaking and both were honored at the Academy Awards. I think this is one of the greatest films ever done. It’s a masterpiece on so many levels. Unique, fresh and very original. I feel and agree like the mainstream critics, this is a mesmerizing and cinematic mastery at its finest. Also, the reality to this film of perfection, is the soundtrack. The music is something that stands out as being memorable, and also groundbreaking. Composer Trevor Jones is a master and gives that mastery to the film. One cannot watch this film without mentioning the cinematography by Peter Biziou. The film is flawless in the acting, direction and story, but most of all, the cinematography is pure art in this feature. Peter has away with a film, and gives his visionary talent to this film. Richard III is one of those films that showcases his passion and art. The film simply put is a truly moving experience of filmmaking perfection in script, direction, acting and atmosphere. Unique filmmaking at its finest. I have seen this film on both VHS and DVD and both cannot compare or come close to this presentation. This Blu-ray, this film looks brand new, as if it just came out. The dark toned atmosphere and vibrant colors, come off the screen as crisp, clear and no noticeable age. This is a perfect transfer, and a perfect new outlet. There is no flaw in the audio or video department of this Blu-ray. Trevor Jones music is filled with such amazing emotional depth, that it lingers long after the film. Trevor Jones has done some of the great films in cinema, supplying the original score for 1981’s Excalibur. The unique and odd horror film, 1982’s The Sender. The one and only, amazing, brilliant and pivotal part of my childhood, the spectacular, magical and fantasy weaved, 1982’s The Dark Crystal. The wonderful 1984 mini-series The Last Days of Pompeii. From both small screen to large screen he has graced the cinema world with a wonderful array of passionate sounds, music that digs deep into your soul and mind and tells you a story. I can sit here and mention movie after movie that he has done, for he is a master talent that bleeds the art-form of crafting a story around his music. His music tells the ultimate emotional understanding of films and Richard III is no different. Also you get the wonderful insert by film historian Julie Kirgo, which, as I always state, I highly look forward to this booklet. Julia Kirgo is the voice of film, and I love reading the booklets and listening to the commentaries, that are sometimes on the special features. Perfect film. Perfect Blu-ray. A must own experience of cinematic bliss at its finest. Acting, direction, story all come together in a flawless retelling of a classic. I highly recommend this movie and this product.